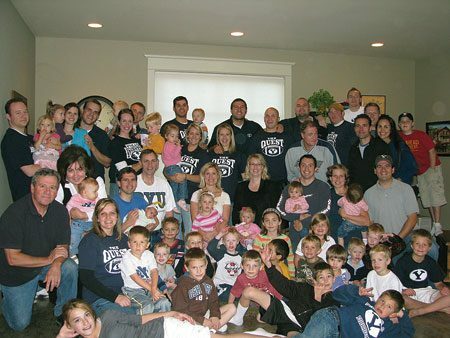 With Cougar sports as their common bond, alumni in Medford Ore., frequently gather in homes, movie theaters, or athletic arenas to cheer for BYU. In southern Oregon, alumni of the Medford Chapter are actively cultivating and sharing the spirit of the Y. Defining themselves as a blend of cheer club and regular chapter, this group of 800 alumni enthusiastically participates in bringing BYU sports to Oregon. Driving four hours to Portland to fill the stands for a Cougar basketball game, renting the local movie plex to watch the football team on the big screen, or gathering at the Idiart home each game day dressed in white and blue, the Medford Chapter involves the whole family in representing BYU in southern Oregon. Not only does the chapter use sports to get involved with BYU, members also use the games to recruit BYU alumni to the area. The optometrist came to scope out the area for his family and left having found a welcoming congregation of Cougars.